UK Music Records are proud to present the brand new single released by Peeta Nakodariya entitled “Dil Dhak Dhak” featuring Amit Rai! 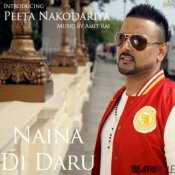 Talented vocalist Peeta Nakodariya teams up with music producer Amit Rai to release his debut single called Naina Di Daru! ARE YOU Peeta Nakodariya? Contact us to get a featured artist profile page.